are partnering for Mini-Split Training! Session One will cover installation, service, and troubleshooting for Fujitsu mini-splits. It will conclude with a brief quiz and lunch break before session two begins. This morning training session is worth three training points for contractors with a Fujitsu Toolbox account. To earn your training points, you must register through Fujitsu’s online portal using the instructions below. Click on Contractor Tool Box Log In. Log in or register for the tool box. Scroll Down to Fujitsu Regional Training. Locate the Able Distributors Date: April 19. 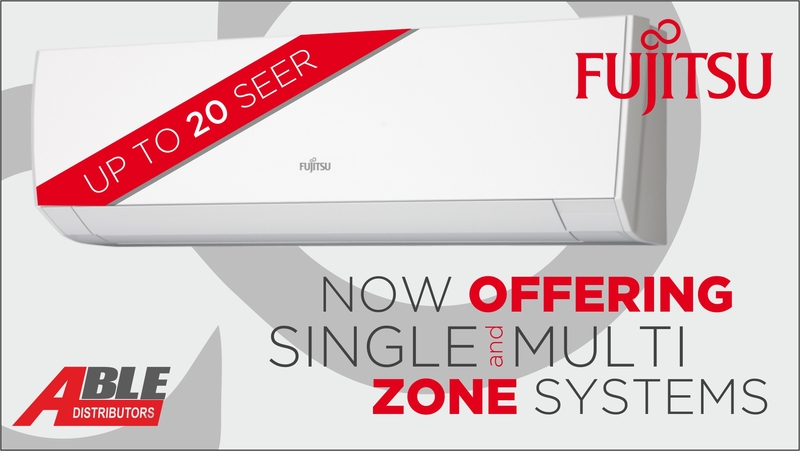 Session Two will cover Fujitsu’s multi-zone systems as well as the new additions to their catalog. Session One runs from 9:00am until 12:30pm. We encourage you to register through the Fujitsu website using the instructions above before RSVPing to Session One here. Session Two runs from 1:00pm until 3:30pm. This session does not require registration through Fujitsu’s site and may be RSVPed for here.